I am NOT a summer girl. I don't like to be hot, I hate to sweat and at best, I'm ambivalent about the sun. I'm a true PNW girl, I love the gray skies and constant drizzle of fall, winter and spring. However I do think we all need a little more sunny things in our every day life. That's what handmade cards are all about right? Sending a bit of sunshine to those we love. I have been having tons of fun with this set! 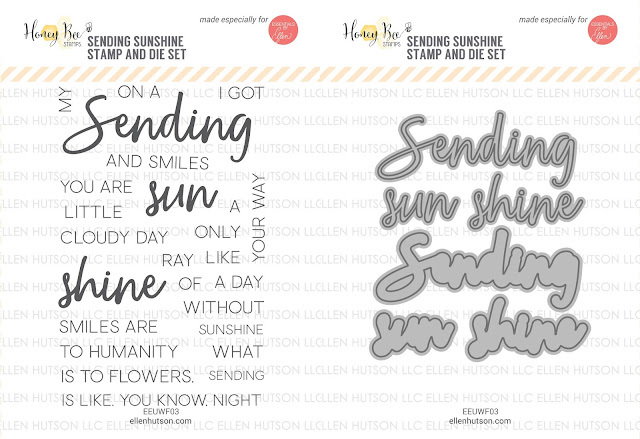 The sentiments pair so well with so many things, including something I consider sunny - citrus! A ring of masking paper to a circle die cut from white cardstock. Low-tack tape to tack down my folded circle notecard and stencil on top. Avery Elle Daisy yellow pigment ink applied first. A second color (Distress Oxide Wild Honey, Spiced Marmalade or Twisted Citron) applied and blended. Removed stencil and inked the remaining edge to create rind. Removed the ring of masking paper and stamp sentiment inside. For the card I used the same technique for the smaller orange slice. I created the dotted background paper by using a ink blended tool pushed straight down. So darling... and don't think for a second that I won't be 'borrowing' that big dot idea!!! so fantastic, Carly! Very cool use of the Nuvo. Beautiful cards.